I think one of the best tools for a railfan photographer is a zoom lens. With a zoom lens (aka a telephoto lens), you can get a vastly different perspective than you can with a wide angle lens. 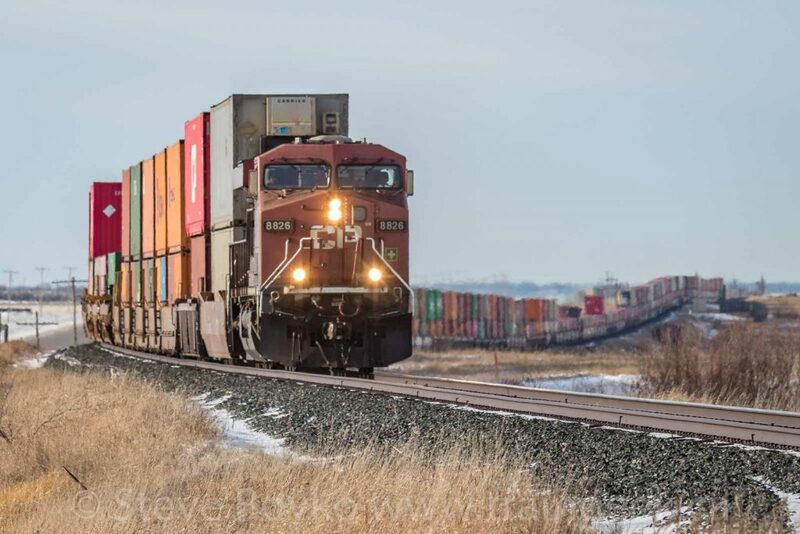 The “reach” of a zoom means you can isolate the subject from a cluttered background, or photograph a train that’s far away without compromising quality. 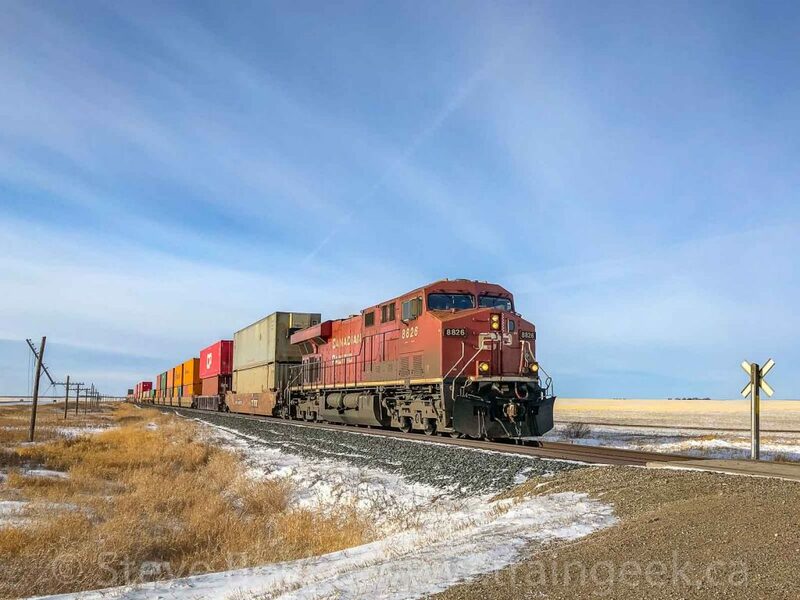 As an example, I offer the above photo of CP 8826 leading an intermodal train between Indian Head and Sintaluta, Saskatchewan. I took that on January 30 as we were traveling toward Regina. I had my Canon 70-200mm f/4 lens on my Canon 77D DSLR camera , with my iPhone 8 Plus for the wide angle view. I photographed the train with the camera as it approached, then switched to the phone to get a few wide angle shots. I hope you’ll agree that the lead photo – taken with the telephoto lens – is a more interesting photo. I like the phone photo just fine, but it’s a pretty common “wedgie” photo, taken by thousands of railfans everywhere. There’s nothing unique about it. I know you can “zoom” on your phone or camera to crop in, but that’s not a real zoom and you are sacrificing image quality. It’s called “digital zoom” and it’s basically cropping the photo as you take it. You really should have optical zoom, like a zoom lens. Some of the better digital video cameras have some impressive optical zoom, like this Sony AX53 video camera. 4K video and 20X optical zoom. Impressive! There are a few downsides to having a zoom / telephoto lens on your camera. The first is a lack of flexibility. More than once, I’ve been “caught” with a telephoto lens on and there’s no time to switch lenses. You can get around that with a lens that covers a very wide range, like a 28-300mm lens or the popular 18-135mm lens if you’re a Canon user. The second downside for a zoom lens is increased shakiness / decreased sharpness when you’re “zoomed out”. Photography has many “rules” and one is the Reciprocal Rule: your shutter speed should not be slower than the inverse of the focal length. So for my 70-200mm lens, zoomed out to 200mm focal length, I should not shoot at slower than 1/200s. I will readily admit that I break that “rule” all the time. 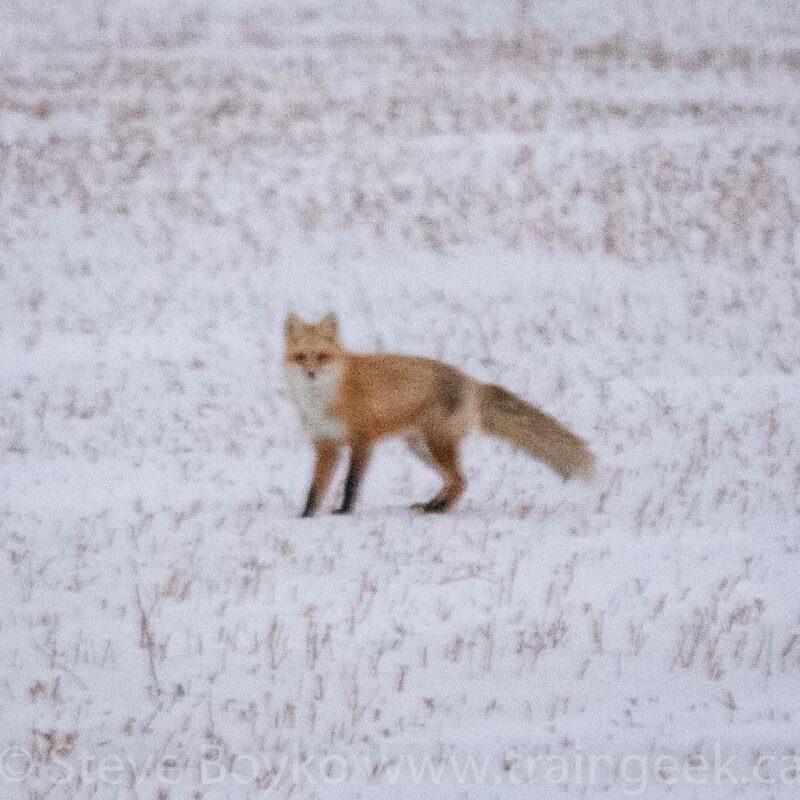 Check out this cute fox I photographed near Belle Plaine, Saskatchewan – at 1/25s at 200mm focal length. This wouldn’t have been possible with a wide angle lens, or a phone’s camera. The image is very grainy, because I photographed it at a ridiculous ISO of 6400 because it was before sunrise. 1/25s, f/4.0, 200mm, ISO 6400… pushing everything to get some kind of photo. What you don’t see is that I threw away at least half of the photos I took of the fox because they were not sharp at all. When I’m photographing with a zoom lens at a slow shutter speed, I take “extra” photos with the expectation that I will delete a lot of them because they are not sharp. I’m fortunate that I’m not back in the film days when you wouldn’t think of doing that! I encourage you to consider getting a real zoom lens. It will be a powerful tool to help you take more interesting photos, and to get photos that you would otherwise not be able to take.